If I saw a jamboree with a stage line-up of Caroline Lucas, Chuka Umunna, Eddie Izzard, Sadiq Khan and Anna Soubry I would cross the street to avoid it. And this has nothing to do with Brexit. Caroline Lucas is the epitome of shallow, narcissistic virtue signalling. The phrase virtue signalling was practically invented to describe her. It's not even a phrase I like but have yet to find a better substitute. But as a much as the woman vomits her progressive credentials she is distinctly authoritarian. The Greens love the EU because it churns outs environmental laws by the truckload. It doesn't matter if this creates monstrous externalities where we find UK refuse dumped in Malaysian rivers. 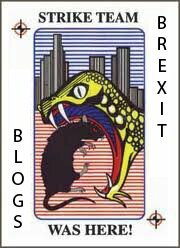 The europhile does not judge the EU on outcomes, only intent. Nor does it especially matter to them that green laws are lobbied for by the largest of corporates not least because they create subsidies and slush funds, but also because they are a means to shaft the competition. But there's is something even more sinister about green politics. It is the view that left to our own devices we would abandon environmental causes which in their priority stack demands that we be stripped of our democracy. Here we are told that without the EU we would still have filthy beaches. Oddly though, the same laws apply to Greece yet Greece has UN certified dead zones along its shores. As to Chuka Umunna, I couldn't tell you what his exact politics are but that's ok because I doubt he could either. Remain just seems to be a platform of convenience. If you were to create a machine to churn out inoffensive centrist media-friendly clones, readily programmable with establishment dogma, it would look and sound a lot like our Chuka. Not quite black, not quite white, not quite left and not quite right. The very last in a long line of anodyne politicians selected by PR firm. Then we have Eddie Izzard, a once amusing comedian whose transvestism USP has gone from the edgy and stylish to the distinctly frumpy even by middle aged Westminster standards. His act showed a remarkable recall talent being able to recite his own material in French but would often use his act to go off on a Europhile rant bleating out all of the usual mantras about being at the heart of "Europe". Never one to knowingly make the distinction between a region and a political structure. But like most comedians these days, he eventually took his own comedic shtick seriously as the basis of a political standpoint. The transition from comedic to preachy and tiresome. That's when they become mannequins for political parties bereft of their own charms - seeking celebrity affiliations to appeal to the yoof. Ever available for BBC charity telethons they enter a select group of hasbeen celebrities deployed to wag the finger at plebs. And what of Sadiq Khan? A shifty opportunist who has no real knowledge of the EU, no particular passion either way, but has calculated that because the London metro class is Remain, so is he. Were he a South Yorkshire mayor he could just as easily be spouting leave dribble. When his term in office is over, so is his career and most will be glad never to set eyes on him again. He knows this, which is why he needs the People's Vote publicity. A shitehawk basically. Last but not least there's Anna Soubry. A politician most had never heard of til now, but famously sent mad by Brexit. Believe it or not I can respect the lady. She's bossy, knows her own mind, and when she did finally think about the EU she decided she was all in. There is but one small problem. She's gone mental. She's lost it. Her gin soaked ranting is actually funnier than Eddie Izzard in his prime. Add in the likes of Vice Cable, Bob Geldof and other doddering nobodies with a smattering of EU funded activists and what you're actually looking at is the establishment in full swing. Everybody who doesn't want their applecart upset by political change - all of whom think the answer to healing the divisions is to cancel Brexit and do more of the same. As to the crowd at this jamboree, one can't help but notice a certain middle class monochrome dynamic which you might expect in a majority white country, but this is highly ironic since these are the one preaching diversity to us. It's the whitest thing I've ever seen apart from Torbay seaside air show. Now I know we can all play this game. A Leave gathering would likely be a line up of some of the thickest, most dishonest politicians in the game, and remianers would rightly point out the elderly gammon dynamic. That's pretty much what eurosceptic events have always looked like for as long as the movement has existed - and always woefully under-attended. You would think by it's persistent poor turnout that it was a minority point of view. But it turns out there are at least seventeen million of us. And there marks the difference in culture. Leavers just aren't the placard waving types. The only mass gathering I can remember was when Jimmy Goldsmith held a rally for the Referendum Party in 97. But that's just not how we roll. Instead we put the work in. The Brexit vote was not a bolt out of the blue. It was a culmination of twenty years work. It's been bubbling under the surface for decades waiting to have a say. This, though, does not matter according to the Remoaner bunch because as they keep pointing out, we will all be dead soon. I'm only thirty nine but will probably expire of boredom before we actually leave the EU. Remoaners shall inherit the earth! This attitude, though, tells us a lot about how they think. There is the assumption that the yoof, fresh fro their progressive education, marinated in EU propaganda will never shed their juvenile notions and so long as they can wait us out then they can built their new Euro-Jerusalem. They haven't noticed that there is a certain stench of death about the old establishment that reeks for more than a Leave Means Leave gathering. This is actually why they are taking to the streets instead of organising a coherent political movement. The Lib Dems are not faring particularly well and nobody thinks a new centrist party could gain traction. They know they do not have the numbers to do it by the book so everything rests on a massive AstroTurf operation in conjunction with a number of well funded foundations and associations of academic grant chasers. I'm not losing any sleep over it. They claim there were nearly 700k marchers last week. Loopy professor AC Grayling claims 1.2 million. Being generous I put it at closer to 300k, cycling upward through the day, but any way you cut it, it is a remarkable achievement. They really do have a talent for mobilising on and off line. Their funded activists arrive out of nowhere and rapidly gain tens of thousands of Twitter followers and are given endless radio airtime. Only money buys that. There is no way it's organic - which is partly why we do not see a corresponding leave movement. There's very little money around on our side unless you are deep in with the Tory right. Once we have left the EU, though, a lot of that Remainer money dries up or is diverted to other causes. Once we are out in March, a referendum becomes a moot point. Out is out and then they have to make the case for rejoining through the formal accession process. That is an argument they cannot win. We will, therefore, see the legacy remain campaign collapse probably faster than Ukip. Meanwhile their FBPE Twitter operation is turning increasingly sour and censorious, and the various legal challenges have completely run out of steam. They maybe a noisy bunch but most of the country, however they voted, generally accepts that we are leaving the EU. And though leavers have little in the way of leadership or active organisation, we are still here. If one thing is clear it is that the legacy remain movement learned nothing form its defeat in 2016. They are still bleating that we were taken in by a big red bus and we've been poisoned by right wing media. They have yet to fully understand that the 2016 vote was a two fingered salute to the hectoring and condescension of the establishment. What is not yet fully understood though is that June 2016 was the opening battle of a long war. 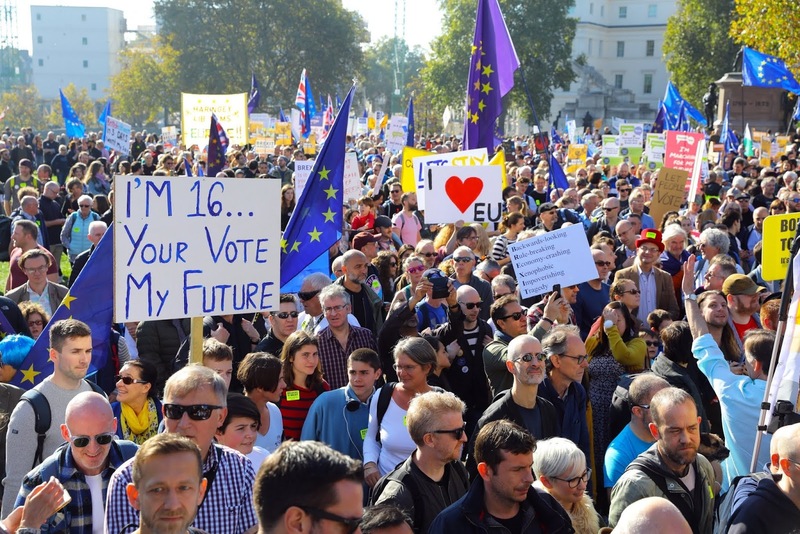 For most at the People's March, the march was little to do with the EU. We didn't see this kind of mobilisation before the referendum. This is the progressive left realising that their grip on power is on the wane and they are not going to go quietly. Marinated in the superstition that Leave is a xenophobic culturally regressive force and "inward looking", imbued with the idea that their "interconnectedness" by way of centralised supranational authority is somehow morally superior, these are quite toxic people and authoritarian to the core. They say they believe in democracy just so long as people they don't agree with don't have a voice. Though was very necessary to bring these divisions to the surface, Brexit certainly doesn't resolve any of it. In terms of culture war, things are probably going to get worse and we can expect BBC drama and radio to be preachier than ever - like they need to double down on the politically correct messages as though we are just not getting it. The problem is, being that the working classes actually live in the real world and not some Doctor Who pastiche universe inhabited entirely by remainers. You can't tell them that the knife wielding miscreants climbing aboard lorries in Calais are our future doctors and nurses - and politically correct whataboutery when it comes to child abuse in Rotherham won't wash at all. It's easy to say "refugees welcome" when you live in a leafy suburb, but the rest of us think twice about opening the doors to Eritrean serial rapists. It's easy to be progressive and have socially convenient values when you are insulated from the consequences of them. Ultimately there is a massive class gulf in the UK which explains why remain messages do not hit home. Convenient cross border travel and no roaming phone charges says nothing at all to a Bradford kid with a pay as you go phone for whom an occasional day out in Manchester is exotic travel. The remain bunch have no conceptual reference in order to relate to working class leave voters. The people's march is not about democracy - and it isn't even about the EU. The fact is that they have kept a lid on popular dissent and deprived it of a voice for a very long time. Genuine working class sentiment has been no-platformed in mainstream politics since at least 1990. The legacy remain brigade want it to stay that way and mistakenly assume that rolling back the referendum also rolls back time. Support for the EU among legacy remainers is more to do with how they identify with it. They imagine their progressive values are embodied by the EU - and if you believe the EU's projected self-image it really does. Course you would have to know nothing about it and suspend all of your critical faculties to do so but then that is remainers for you. You would have to be completely blind to its corrupt lobbying culture and its murderous trade policies and how freedom of movement is robbing eastern Europe of its vitality and eroding its professional class. The legacy remain movement lives in a fantasy world - where the jihad incubating slums of Yorkshire don't exist, where the EU brings prosperity to the regions, where Radio 4 comedy is funny. They then wonder why Ukip managed to get a foothold. It can only possibly be because the plebs are thick and racist right? Even now, London politics doesn't know how to connect with the public. We have seen hamfisted attempts by the Tories to relate which explains Theresa May's "citizens of nowhere" conference speech. I actually liked it but it provoked howls of rage from the chattering classes. Tories will always appease the media gallery and back down. This is what happens when politics becomes a full time profession. We end up with a remote governing class with completely alien values left to take guesses what the public actually want. This is why the divides cannot be reconciled without a fundamental change in the way we do politics. London is an alien culture to the rest of the country. London's narcissistic metropolitanism may very well converge with Brussels but it has nothing to say to Bradford, Bristol or Newcastle. Everybody recognises this. The question is one of what to do about it. We talk about devolution but our managerialist government doesn't know what the word means. Recent experiments include directly elected mayors and police commissioners along with pushes for regional assemblies. All we end up doing is creating fiefdoms for the dispensation of central grant money. People power it is not. These are not sovereign authorities. They are mired in KPI culture carrying out objectives defined by Brussels and Whitehall, geared toward meeting quotas and hitting targets. The bipeds we elect to these entities have no powers to speak of and are mere functionaries of the machine. Democracy is more than just holding perfunctory voting rituals. The public must be able to organise locally, take control of their institutions and define their own policies according to their own values and priorities. If the bureaucracy is so ossified that elections have no meaning, and we are so constrained by the dead hand of Brussels, then our democracy is meaningless. Our institutions are working to values defined by remote technocrats who have never even visited the places they legislate for. The "people's vote" march to overturn the referendum is not at all concerned with democracy. They couldn't adequately define it and if they could they would not be remainers. These are people for whom remote technocracy works just fine. Many of their non-jobs depend on it and it ensures their own values hold supreme whoever is elected. It is with a certain soviet irony they called it a "people's vote" when this was really a march to contain democracy. They march to ensure that those of us who have not had a say for decades remain voiceless. The last thing these people want is meaningful votes.